In case you are wondering who this is, its Bull from night court. No this ex is not the ex that is now a current. (wow could I be more confusing?) But his daughter sang the national anthem for one of the NBA finals games and that made me think of this story from when we dated. 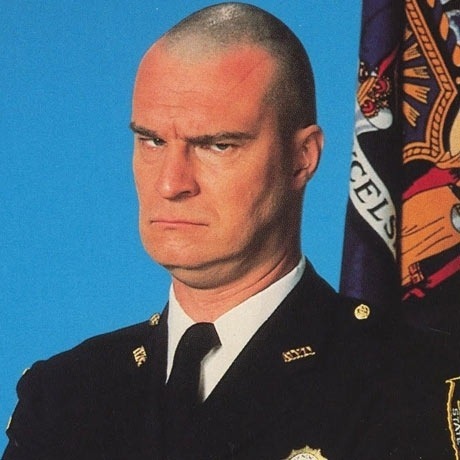 If you've ever seen Night Court you know that Bull is seriously tall, bald, and goofy. So was the Bull I dated. A difference is that the Bull I dated also wrestled, heavy weight, because he was about 6'4. Yes I was still only 4'10. I think I came up to his waist. He gave me his jacket to wear and of course it was a tent on me. One morning, before school, I over sprayed the jacket with perfume. It made my eyes water it was so strong. I tried to wash it off in the bathroom sink,but I think it only made the perfume mad and the smell grew in intensity. He found me, and probably wished he hadn't because the smell was so strong. He said he needed his jacket back because he was leaving for the state wrestling tournament. I handed it to him, relieved to be free from the stink. He gave me an OMG are you kidding me look and I laughed. He didn't do so well, and I am sure he didn't make any friends smelling like he took a bath in girly perfume. That is an enormous height difference. And you know, I would have thought he'd done better if he reeked of perfume. Imagine what a distraction that would be for an opponent! lol I think I may have done that too. I was the shortest girl in school and he was the tallest guy. I really have a thing for tall guys like average for me is 6'. I think I am over compensating for not even being 5 feet. I wondered why he didn't do better considering no one could stand to be near him, I think he was just a bad wrestler. And how random that his daughter sang in one of the finals games! And wow, he was tall! There's just so much here. First of all, being that tall, he should have been a great wrestler. Like, physics and stuff. Secondly, I applaud you for throwing caution to the wind and dating someone so tall. I'm 5'3" on a good day, and I dated a guy who was 6'6" for several years. It made me appreciate finding someone a little more my size - like, "Wow - I had no idea what a bad fit the other guy was - literally and figuratively." He may have been just not at state. I can't really say for sure, because I was a bad girlfriend and didn't attend any events. I usually date guys who are around 6 foot. I think its because I need someone to reach things on tall shelves. She is pretty well known in this area for having an amazing voice. She has sung for NASCAR, College ball games, Actually I'm not sure what else lol.